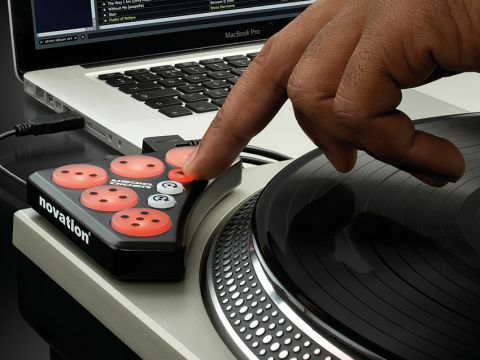 A clever little solution for DJs that puts the control buttons in just the right place. Sits in the right place. Highly responsive. Intelligent lighting. One of the Dicer's biggest selling points is the fact that it sits so nicely on the edge of a deck. Intelligent lighting is a really nice little feature for Serato users. Now that most manufacturers have done the generic MIDI controller to death, we're seeing the next wave of controllers, designed for specific jobs or even specific software functions. In our opinion, this is definitely a good thing, as we'd rather have something doing one job well than something else doing a lot of things, but only doing them okay. Novation's Dicer is one of the next wave, and this compact controller is targeted at DJs - specifically Serato Scratch Live users - who want to get some extra hands-on performance from the Looping features. Just like decks, Dicers come in pairs, and it can be securely mounted on the corner of a Technics 1200. On the underside is a circular mounting block (this can be detached by unscrewing it) that enables it to slot into the 45 RPM adaptor recess of the deck, so it won't wobble when prodded or knocked. Funnily enough, this is one of its major selling points - if you've ever tried to find space for a MIDI controller in a DJ booth, you know just how difficult it can be, so having a controller that sits in exactly the right place is a liberation. If you need to attach them to CDJs, or prefer to position them on a different part of a deck, simply detach the mounting circle and use the DJ putty provided to stick them in place. So, we're off to a good start - but thankfully there's more. Dicer is USB-powered and uses the smaller USB Micro 1.1 standard connectors. The pair of units are identical, so either can be connected to the computer. To save using two USB ports to connect the pair, you can daisy-chain the units together using the provided mini jack cable. To clarify, although this is an audio lead, it's only used for MIDI. Setup time is short and sweet. Just mount the Dicers to the decks, plug them in and you should be good to go. They are class-compliant, so there is no driver installation and, since, they are pre-mapped to Serato's Looping and Cueing functions, it's game on as soon as you see them light up. The layout features five big round rubber buttons and three smaller ones. The big ones are numbered like dice and are the main ones used for performance; the smaller ones are used to select the various modes. All of the buttons take advantage of intelligent backlighting and use three colours to distinguish themselves from one other. The first thing to do is to select one of the modes to play with. Let's start with Hot Cue mode - this makes the unit light up red and enables you to store up to five cue points using the big buttons. To store a cue point, simply tap the button, at which point it will light up to indicate it's saved it. You can delete a cue point by holding down the little Cue Mode button and pressing the active Cue button, at which point the light should dim and it will be ready for re-arming. The second mode is backlit in green and controls the Loop Roll feature. This is great for adding cool fills and stutters without interrupting the flow. This time, pressing and holding any of the buttons momentarily loops the track. The five buttons correspond to different increments, starting at one beat and rolling through half, quarter, one-eighth and one-16th of a beat. Obviously, this is only going to work smoothly if the track in question has had its BPM analysed in advance. The nifty thing about Loop Roll is that the track will resume from the point it would have reached. So if you hold down Roll for two bars, when you release it the track will play from two bars after the initial button press and so will always be in sync. The third mode is for Auto-Looping and makes the buttons light up in amber yellow. It differs from Loop Roll in two significant ways. Firstly, the five loop lengths are longer, ranging from one beat, two beats, through to four, eight and 16 beats. Secondly, the Loop function is activated by toggling the button on or off. After a few hours of playtime, it's easy to get addicted to using the Dicers, simply because they make it so easy to explore the different possibilities which can be performed with the buttons. They are mega-responsive to touch, and the triggering is lightning-fast. Another nice feature is that when holding down one Loop Roll button, you can tap another to create polyrhythms without the Dicer getting confused and glitching. In the lead-up to its release, Novation were heavily hyping Dicer as a 'game changer'; now that it's uncovered, some may wonder what the difference is between using this and any other generic MIDI controller to operate Loop functions. In our opinion, it's the combination of ergonomics and intelligent lighting that justifies the hype. If you're sick of taping controllers to the side of your decks, only to knock them off halfway through a show, this is for you. Our only reservation is that it's a bit expensive compared to other controllers; there's nothing similar right now, but that could easily change. If you've been reluctant to dive into SSL's Looping/Cueing features because they don't feel right, this may well change your mind.